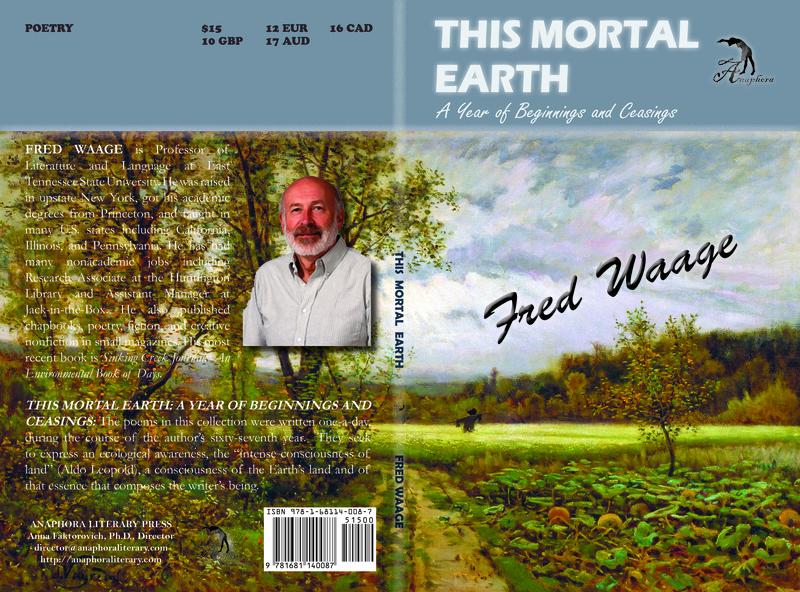 This Mortal Earth: A Year of Beginnings and Ceasings: ($15, 114pp, 6X9″, Softcover ISBN: 978-1-68114-008-7, Hardcover ISBN: 978-1-68114-109-1, LCCN: 2015930077, January 2015; Purchase on Amazon or Barnes and Noble): The poems in this collection were written one-a-day, during the course of the author’s sixty-seventh year. They seek to express an ecological awareness, the “intense consciousness of land” (Aldo Leopold), a consciousness of the Earth’s land and of that essence that composes the writer’s being. Fred Waage is Professor of Literature and Language at East Tennessee State University. He was raised in upstate New York, got his academic degrees from Princeton, and taught in many U.S. states including California, Illinois, and Pennsylvania. He has had many nonacademic jobs including Research Associate at the Huntington Library and Assistant Manager at Jack-in-the-Box. He also published chapbooks, poetry, fiction, and creative nonfiction in small magazines. His most recent book is Sinking Creek Journal: An Environmental Book of Days.